Shelter and the CPI, a Mistake? The 5 Stages of the Chinese Real Estate Bubble? 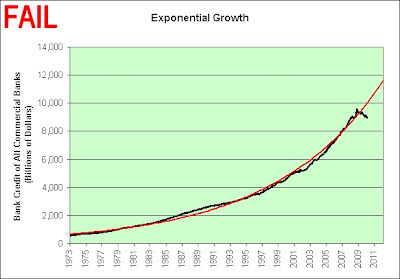 The data is on a log chart so that a constant growth rate is indicated as a straight line. I included two trend lines. One is peak to peak. The other is trough to trough. The volatility in the PPI's range of movement has clearly moderated greatly over the last century. It has been confined to a channel that has narrowed over time. The Great Moderation was a phrase sometimes used to describe the perceived end to economic volatility created by 20th century banking systems. The term was coined by Harvard economist James Stock. The validity of this concept as a permanent shift has been questioned by the economic and financial crisis that started in 2007. The Great Moderation no longer seems to apply to our economy as a whole, but it does still seem to apply to producer prices. Although past performance is no guarantee of future results, it is something worth thinking about. Here's something else to think about, but it comes from a place not so brightly lit. One feature of the chart is not moderating. The time from peaks to troughs and troughs to peaks was generally 10-20+ years. You can see it right in the chart. 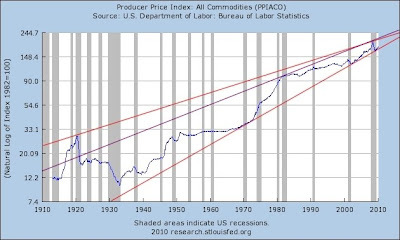 Our recent financial crisis managed to send producer prices from peak to trough in just one year though. That's unprecedented. I believe it is an indication of the extreme leverage being applied in this grand banking experiment. The beast being moderated continues to grow, but so do the heavily leveraged control knobs. Turnover in all exchange-rate derivatives measured by notional amounts went up by 5%, to $444 trillion, between October and December. That's 22% higher than the trough seen in the first quarter, but still well below the $690 trillion peak seen in early 2008. A few hundred trillion dollars spent on control knobs here, a few hundred trillion dollars spent on control knobs there, and at some point we're talking real money. Update: Based on the comments of "jus me", I have added a new purple trend line to show what would happen if we threw the 1920 peak out. It still converges, just not as much. With almost every problem, one wants to look at what represents some kind of rising or declining exponential growth curve. I offer three "mind blowing" questions. 1. What is China going to do with all that office space? 2. Where is China going to find seven more Saudi Arabias? 3. How many more years will it take before we've fully mastered perpetual motion technology? Economic Disconnect has pointed out what looks to be a glaring error. He points out the problem as seen here. It may just be part of the annual recalculation of the seasonally adjusted indexes throwing things off, but even then it looks like a mistake. There's nothing quite like adjustments to adjustments to muddy the picture. UPDATED Each year with the release of the January CPI, seasonal adjustment factors are recalculated to reflect price movements from the just-completed calendar year. This routine annual recalculation may result in revisions to seasonally adjusted indexes for the previous 5 years. BLS made available recalculated seasonally adjusted indexes, as well as recalculated seasonal adjustment factors, for the period January 2005 through December 2009, on Wednesday, February 17, 2010. Let's look at the raw nonseasonal data and see how accurate it appears. That's all that really matters to those of us tied to the CPI (say investors of TIPS). We are not paid based on seasonally adjusted data. We are paid based on the raw data. Shelter is composed of the following 4 items. That's within the rounding error of the 247.950 that's claimed. At least that data seems consistent. THE TECHNOLOGICAL SOCIETY; WHAT JOBS WILL BE OUT THERE IN 2001? A need for people with a strong background in the humanities may flourish once again. Here's my take on the CPI. It might explain why TIP underperformed IEF and TLT today. Look at the details in Table A. This is the seasonally adjusted data. It makes it easier to see what's really going on out there. The drivers of inflation for the month were mostly energy. The energy index rose 2.8 percent in January, its ninth consecutive increase. Oil was just under $80 a barrel when I sold TIP in November. It's just under $80 a barrel now. There's at least a chance that the energy index will stop going up at such a rapid rate. The drivers of deflation for the month were mostly shelter. Shelter is a good chunk of the overall CPI. The shelter index declined 0.5 percent. The index for lodging away from home fell 2.1 percent, while the rent index was unchanged and the index for owners' equivalent rent declined 0.1 percent. Here's the entire list of months since 2000 that had declines in shelter from the previous month. There were only 4 declines in the 109 months of the period. 2 of the 4 declines were in the last 3 months. Even though we all know the housing market crashed, the shelter part of the deflation story didn't begin until October of 2009. The seasonally adjusted shelter index peaked at 249.644 at that point. It now sits at 248.029. That's a 0.65% decline. There's no telling how much further the shelter index will decline. Demand for infrastructure is constant. It's a "sure thing" investment. It's just like land. They never make any more of it. There's nothing that can stop an up and coming superpower once the momentum has been established though. Everyone knows it. America's larger cities in the 1920s enjoyed strong growth. With the end of large-scale immigration, populations stabilized and the plentiful jobs in the cities pulled families upwards in terms of social mobility. Investment in office buildings, stores, factories, utilities, streets, and, especially, apartments and single-family homes, added substantially to the infrastructure, supported a very even better times were ahead. After 1929, the optimism ebbed away, overwhelmed by a deepening pessimism that made long-term private investment seem inadvisable. The Depression's damage to large cities, suburbs, towns and rural areas varied according to the economic base. Most serious in larger cities was the collapse of the construction industry with new starts falling to less than 10% of the norm of the late 1920s. Although much needed work was deferred, maintenance and repair of existing structures comprised over a third of the private sector construction budget in the 1930s. Devastating was the disappearance of 2 million high paying jobs in the construction trades, plus the loss of profits and rents that humbled many thousands of landlords and real estate investors. Analysts say, however, that the government may not be able to rein in the property sector too aggressively since it is a main pillar of the economy with its investments accounting for over 10 percent of gross domestic product. Real estate was a main pillar of America too. The government sure wanted everyone to own homes. Due to a lack of other investment options and as real bank deposit rates turn negative, more of China's accumulated wealth and savings are likely to pour into real estate in many top cities, potentially exacerbating inflation and home prices for the grassroots. The real interest rate on the 5-Year TIPS was roughly 1% when I turned bearish in 2004. It's even lower now. Our housing market still crashed though. 3. The Bubble Becomes a "Sure Thing"
"But if we have any surplus money, we'll invest it in another flat," added Zhou, who runs a printed circuit board factory with her husband in Songgang, a gritty town in Shenzhen's western suburbs. "We'll wait till after the lunar new year ... After that I think the market will rise again in the long term for sure." Most were fairly convinced that real estate could never fall here either. That list would even include Ben Bernanke. At the very peak of the market he claimed that there was no housing bubble to go bust. "You will find that the ratio (in China) is very, very high. (It's) very unaffordable because a lot of cities -- we're talking about 60 percent to 70 percent of their monthly household income -- needs to be used for monthly mortgages," said Wee Liat Lee, an analyst at Nomura International. 100 percent is pretty much the theoretical maximum. I would also argue that the 100 percent ceiling has probably never been tested on this planet. Ever. "The central government is trying to get the price down for a short period of time. They're squeezing out the people with money to allow the middle class to be able to afford (property) again," said Andy Xie, an independent China economist. In my opinion, someone in the Chinese government finally realizes that they've gone too far. It's all damage control from here on out. These are just my opinions of course. Those betting heavily on the "sure thing" global inflation story and/or the Chinese economic miracle story better hope that I am wrong. I just love commodity driven stock markets! Oil is up 4% today. Let's hope the trend continues. Can't you just feel the prosperity flowing again? NEW YORK (Reuters) - Oil prices jumped 4 percent to above $77 a barrel on Tuesday, responding to a weaker U.S. dollar, stronger equities, and growing tensions over sanctions against Iran. For the love of all that is holy, please continue to increase those tensions! Do not let us slide back into deflation again or all is lost! The Dow Jones industrials rose about 130 points in late afternoon trading. The dollar fell as money moved out of safe havens and back into riskier investments like oil and other commodities. Oil is up roughly 4%. Stocks are up roughly 2%. That's a 2-1 ratio. That's pretty much the trend since the bottom of the markets. Let's see what happens if we simply extrapolate this into the distant future. If we can get oil to $450 per barrel, then the Dow should hit 30,000! Woohoo! We'll be rich beyond our wildest dreams! Here's what the customers are saying. What a brilliant, insightful tome on investing cycles. The author makes an iron clad case as to why the Dow will skyrocket to the stratosphere by 2008. I can find NO FAULT in his logic. Leverage is the key to success in this world of ours. Everybody should borrow against ANY asset that they have, especially their home, up to 30 or 40 times the fair market value. As everyone knows, homes NEVER decrease in value. Anthony Bolton is launching his new China fund in April as an investment trust. Normally, investment trusts trade on their merits – IFAs get no commission for piling people into them. Not so with this one. Fidelity is paying commission to advisers who recommend the fund for their clients’ individual savings accounts. If China was such a dead cert of an investment, why would they feel they needed to do that? The overriding problem is that the Chinese model leads to a deflationary spiral that is perpetual in nature. China is overheating, and as it corrects, it will take global commodity demand down with it. But the products have become more complex, with some, such as index trackers, backed by swap contracts with other financial institutions, not investing in the commodity directly. To some they now offer an uncomfortable reminder of the toxic mortgages that led to the credit crunch, when investors had little idea of what they actually owned. Last June it also launched a physical commodities fund which has drawn in an additional $20 million from ultra-high net worth individuals in Switzerland and Liechtenstein, many of whom were alarmed by the collapse of Lehman Brothers and financial market wobbles. I must be having a problem with my math. There are "many" alarmed ultra-high net worth individuals in multiple countries and yet all they managed to scrounge up was $20 million? "Copper always has a price and the price is never zero," he said. If I hear that argument one more time I think my head will explode. The exact same thing was said of real estate. Copper peaked at $4 per pound and fell all the way to $1.30 when the global housing market fell apart. That's a 68% loss. The stock market didn't even do that poorly. Copper now sits at over $3 per pound, which in theory is high enough to actually crash again. The popularity of the "housing bubble" theories peaked in mid-2005. Using hindsight, the housing market did crash over the next few years. The popularity of the "oil bubble" theories peaked in the spring of 2008. The crash came later that year. Here's a chart showing the popularity of "China Bubble" theories. "Gold Bubble" theories have just now turned popular too. "If you look at the drivers behind commodities, it's really the fact that growth is around the corner," said Bob Tull, chief operating officer of Old Mutual Global Index Trackers. "The economy looks like it's turning around here, and China's made some positive statements." “If you look at gold’s activity this year, every time we’ve had monetary tightening, or we’ve had comments from the Bank of China, or from commercial banks reducing loans, gold has tended to sell off with other commodities,” Steel added. Entire countries have jumped on the gold band wagon of late, with India purchasing 200 tons in November, the single largest purchase of the commodity by a government central bank in three decades. Recent rumors that China is strongly mulling a big purchase similar to India’s have kept the price of gold above the $1,000 an ounce range, according to analysts. It's a band wagon all right... China, gold, China, gold, China, gold. For those who think that the best time to buy gold is when central banks are buying, I would like to point to the period between 1999 and 2002. It was without a doubt the best time in the last 30 years for the private investor to be buying gold. What were central banks doing? Selling. They have revealed that Bank of England officials had serious misgivings over the chancellor’s determination to sell 400 tons of bullion in a series of auctions between 1999 and 2002, when the price was at a 20-year low. That was 2006. Most of those students have probably graduated. That leads to an obvious question. Just where do you suppose all those bicycles are parked now? “China is the only place in the world that despite having more empty buildings than the rest of the world has yet to reflect those valuations on their balance sheet,” Rodman said. Gazing south from the building that houses the Beijing headquarters of Goldman Sachs, UBS AG and JPMorgan Chase & Co., one of the first structures in the field of vision is a 17-story office tower at No. 9 Financial Street. Empty. Farther along are the two 18-story towers of the Bank of Communications Co. complex. Dirt is gathering at the doors and the lobby is now a bicycle parking lot. A spokeswoman for the Shanghai-based lender didn’t return phone calls and emails. Feb. 11 (Bloomberg) -- Greek bonds rose for a third day as European Union leaders demanded the nation’s government get its budget deficit under control, while stopping short of offering specific measures to help manage the country’s debt. Please focus on those words for a few moments. Wow! That's some serious support! Thank God someone in charge had a Thesaurus! Who would have guessed that they could be that clear, unambiguous, strong, rigorous, and transparent while simultaneously coming up so short on details? It's a miracle I tell you. 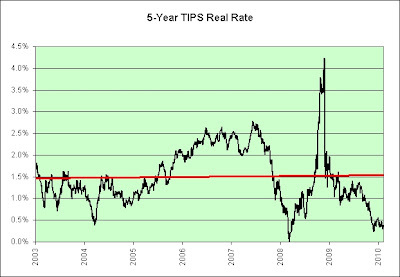 As seen in the linear red trend line, the 5-Year TIPS real rate averaged roughly 1.5% over the past 7 years. It's now less than 0.5%. You will note that the slope of the trend line is neither heading down nor heading up. It is rock steady. Why are we so far below the trend line? One might argue that it is different this time. That argument comes up a bit short though. What's different? Over the past 7 years we've seen just about every sort of economic environment there is. 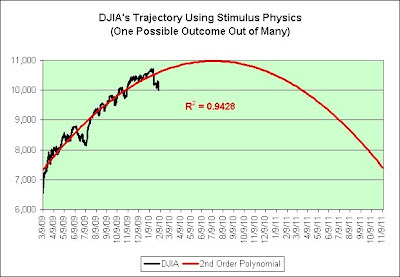 We've seen stock market euphoria as the DJIA breached 14,000+. We've seen inflation fears as oil breached $145+. We've seen deflation fears as the housing market, the stock market, and the commodity/energy markets crashed. So what could possibly be different this time? Even deflationary Japan has fairly decent real interest rates (mostly due to the deflation). So why don't we? Some would argue that all this new debt we're taking on is ultimately inflationary. Here's another argument though. What happens if the supply of debt someday exceeds the demand? Was subprime debt ever known for its low interest rates? These interest rates are clearly VERY low. So what happens if the world ever thinks of us as subprime? Buyer beware. I really don't think it is different this time. It will be especially not different this time if we actually experience another deflationary event. Check out those 4% real yields in the chart. Fixed income, most notably TIPS, or Treasury Inflation-Protected Securities, and one- to three-year bonds, led the asset surge into ETFs last year, taking in more than $200 billion through the first 11 months of 2009. That just figures. Keep piling in. Get used to disappointment though. It makes no sense to lock in real yields this low for a solid 5 years. Even if investors are right and inflation does take off, then 0.5% real yields are a lousy defense. If inflation averages 5% then you'd only be earning 5.5%. After taxes, you'd most likely be losing money. Let's say the economy continues to stink in 5 years. Then what? Reinvest into more money-losing short-term TIPS? Is that the long-term plan? I may be certifiably insane, but I'm actually going to be buying some 30-Year TIPS in this month's auction. The yield curve is very steep. It's steep for a reason. It's to help the banks borrow short and lend long. Well, I'll take some of that help too. The real yield should be at least 2% in the auction. I'll be buying and holding until maturity. It's plenty good enough for me. I won't be protected from serious hyperinflation or outright default, but at least I'll be protected from the slow endless grind of lousy real yields. Just picture the stock market over the last decade if you need a visual. This is not investment advice. I'm just saying what I am doing and why I am doing it. I see little to no value in short-term TIPS. For the life of me, I just can't see how others do. Update: Watchtower pointed out the perfect theme song for this post. WASHINGTON -- Treasury Secretary Timothy Geithner said Sunday that the U.S. wasn't in danger of losing its triple-A bond rating, in the wake of a warning from Moody's Investors Services about the U.S.'s treasury-bond rating. "Absolutely not," Mr. Geithner said in an interview with ABC News's "This Week" when asked about the prospect of the U.S. losing its top rating. "That will never happen to this country." Never is a very long time. A lot can happen in an eternity. I would have settled for assurances that we wouldn't lose it in my lifetime. In fact, I would have been tickled pink. This was overkill though. It kind of creeps me out. Tim? Can I call you that? I have some advice. Perhaps you should stick to your 2005 April Fool's Day plan. It was really working for you. These dimensions of the broader context in which we will be making monetary policy in the years ahead put a very important premium on keeping U.S. monetary policy as close to the frontier of credibility as possible. * We will not lose our AAA credit rating in my lifetime, as long as we don't do the same stupid things we continue to do and it isn't already too late to fix our problems. I'm not trying to give you a hard time though. Like Immelt once did, you are doing all you can to protect our AAA credit rating. Still, Immelt did reaffirm GE’s 2008 guidance, along with the company’s commitment to its 2009 dividend and to doing what’s needed to maintain its AAA credit rating. Check out this commitment to its 2009 dividend. It seems GE also strayed from the frontier of credibility. For months, Chairman and CEO Jeffrey R. Immelt has promised to manage the company both to preserve its dividend, a handsome yield for the company’s widely held stock, and to maintain its AAA credit rating, which gives it lower borrowing costs for its GE Capital unit. Check out GE's promise to maintain its AAA credit rating. "We will continue to run GE with the disciplines of a Triple-A company," Immelt said in a statement Thursday. The AAA-rated company is an increasingly endangered species. If AIG falls off the list of AAA companies, it will be the latest dropout in what's been a drastic trend since the 1980s of companies losing their top-notch ratings. A debt rating of AAA is the gold standard — the cleanest bill of financial health — and means a company can borrow money at lower interest rates than those with less pristine credit ratings. AIG did fall off the list. It was not exactly a soft landing either. The elephant in the room, the Oregon public pension system, is about to swallow an additional $1 billion-plus from school districts and other public employers over the next two years. Does Monster's Acquisition Of Yahoo! HotJobs Matter If The Internet Is The Job Board? The elephant in the room is that the economic jolt of September 2008 has permanently altered the job market and dramatically accelerated labor trends underway for many years, such as the growth in job turnover throughout a person's career. Election of Republican senator may change politics in Mass. The housing market has an enormous elephant in the room, and no one seems to be able to move it. If homeowners start walking away from their mortgages en masse, there’s little doubt the housing market will collapse and take the economy with it. Costs are exploding, and although the word “rationing” is gingerly avoided, that’s what the state is talking about, just as the federal government is, even with the current health plan stalled and perhaps doomed. Exports have been U.S. blind spot: Commerce Sec. "China is the elephant in the room," Cassidy said in an interview. It's a circus. It's a show. Just dance until the music stops again. It's going to be okay. "This represents a down payment on what California is owed," Department of Finance spokesman H.D. Palmer said after the Obama budget was released. "The governor will continue his work with the Obama administration and congressional delegation to secure the balance." Here's the balance of what the rest of America owes you. The average home in London, including all those dreary outskirts that go on and on and on, is $436,000. That's even higher than it was as recently as 2006, when the bubble was in its late stages. What happens if China's 'bubble' pops? "Because prices are so heavily managed, China could easily flood the U.S. and the world with extremely cheap stuff," says Morici. If nearly everything America buys is made in China now, just wait. The trade imbalance would spiral further out of control; and manufacturers in other nations fighting China for market share would be at a greater disadvantage. "Remember, when we talk about bubbles, the stakes are the future of the Communist Party," says Morici. "They'll try to survive no matter what; and it could mean destroying other economies to do it." Disappointed by losses in stock markets and bonds during the recession, investors had turned to commodities in the hope of better returns, many borrowing at very low interest rates. There's something really satisfying about a perfect bubble gum bubble. It's also fun to see just how big you can make it. Of course, when it eventually pops, trying to peel the pieces off your face and pluck them from your hair puts a damper on things. We'll clearly need something epic to do this musical tribute justice. Feb. 4 (Bloomberg) -- The California State Teachers’ Retirement System, the second-biggest U.S. public pension, is considering investments in commodities to boost returns and provide a hedge against inflation and slumping equities. Did they like commodities at lower prices? No. Do they like commodities at higher prices? Yes. Maybe it is different this time lord. Global investors’ fears about a potential full-blown government debt crisis in Europe fueled a massive rush for safety on Thursday, driving stocks, commodities and other assets sharply lower. Feb. 4 (Bloomberg) -- Crude oil tumbled the most in six months as the dollar gained and a drop in stocks bolstered skepticism that the economic recovery will be sustained. NEW YORK (Dow Jones)--Gold futures fell more than $50 Thursday to their lowest level in three months as investors moved out of perceived riskier assets on concerns about euro-zone debt and weaker-than-expected U.S. weekly jobless figures. WASHINGTON, Feb 4 (Reuters) - The number of U.S. workers filing for jobless benefits unexpectedly rose last week, but another big gain in productivity in the fourth quarter offered hope companies were getting close to adding to payrolls. Can't you just feel the hope? Worries about China's moves to rein in economic growth have sent copper futures reeling this year after prices more than doubled in 2009. However, even as Chinese authorities take steps to tighten credit availability, demand from the world's largest consumer of the metal is forecast to remain strong and global copper supplies are likely to show only a small surplus. That means a dramatic selloff is unlikely for the metal, say market participants, some of whom see the current weakness as a buying opportunity. We all know how unbiased "market participants" can be. If I am told a particular bridge is unlikely to collapse, then I tend to look for alternate routes to bypass it. Maybe that's just me. I'm just not much of a risk taker. The reserve bubble is actually an Asia-wide phenomenon. And we should stop viewing this monetary arms race as a source of strength. Here are three reasons why it’s fast becoming a bigger liability than policy makers say publicly. One, it’s a massive and growing pyramid scheme. The issue has reached new levels of absurdity with traders buzzing about crisis-plagued Greece seeking a Chinese bailout. After all, if economies were for sale, China could use the $453 billion of reserves it amassed last year to buy Greece and Vietnam and have enough left over for Mongolia. Oh crap. That's only one of the three reasons. I now remember why I only lean towards deflation short-term while simultaneously hoarding toilet paper. Think about how Dubai shook the global economy, or how the mere hint that Chinese growth may dip below 8 percent inspires panic. These disappointments pale in comparison with the turbulence that may come from Asia’s biggest bubble popping. As usual, he makes a good point. This global economy is seriously messed up and grows more unstable by the year. On a lighter note, I feel better about my stagflationary name long-term. Sigh. If you watch nothing else, at least catch the part from 27:50 to 29:30. This is what he said yesterday. Just presume it will go down. Presume that the companies that report good numbers will get hurt and the companies that report bad numbers will get destroyed -- just like last week. Presume that we are going into a slowdown and that last year's market is over. Here's what he is saying today. One of the most annoying things about those who are negative about the market is that after you have a 3% to 5% correction, they are right into your mailbox with charts and graphs and times and dates for when they told you we were going to be at a high and that we would go much lower. "There, there, I told you so," they say. As if they don't sound like children, frankly. In my opinion, he's a preachy holier-than-thou short-term rear-view-mirror looking hypocrite. Get a low rate with payments that are based on repaying over 30 years. The payments are based on 30 years. The loan is based on 5 years. I'm a saver. I owe nothing on my house. Let's see how I could abuse this. I could take out a mortgage and invest the difference somewhere. Let's assume the tax break on the mortgage offsets the taxes on the alternative investment. I'd therefore only need to make 3.89% on the money to break even. Any more than that is just pure gravy. At the end of the 5 years I could pay off the loan and pocket the difference. Now all I need to do is figure out where to safely park the money to earn more than 3.89% over the next 5 years. How hard could it be? The bar is so low. How about 5-Year Treasuries? I can earn 2.37%. That's not good enough. How about 5-Year TIPS. They yield 0.35%. If inflation averages over 3.54% then I'd be doing fairly well. Call me skeptical though. What if the inflation never arrives? How about the stock market? No matter how high it goes, the experts assure me that it's always good for another 10%. I think I shall pass on that. Further, this is supposed to be a mortgage for "savers", not for "investors". Gold? Can't do it. Some might argue it is a form of savings, but let's get real here. It's a speculation. It might pay off big. It might lose big. It's just too volatile to bet the house on. Oil? Yeah, I'm going to bet my house on that roller coaster ride. $11 to $140+ to $30+ to $80. While I am at it, I'll put a third of it on the number 22 in Las Vegas. I'm feeling really lucky! How about ING Direct? I consider it to be a pretty good place for savers. I've got money parked there. I just recommended it today. Unfortunately, they only pay 1.25% on savings. That's clearly not going to work. I'm stumped. I can't seem to find a "sure thing" that will appreciate by at least 3.89% per year over the next 5 years. I guess I shall pass. I don't want to risk my house if some sure thing turns into a sure flop. There is some good news though. I sure don't feel the need to brace for hyperinflation right now. Maybe others shouldn't either? WASHINGTON, Feb 1 (Reuters) - The White House budget proposal released on Monday assumes the U.S. economy is heading for a six-year run of above-average economic growth with no sign of a worrisome spike in inflation or interest rates. The story behind "Devil's Trill" starts with a dream. It's one of the most difficult pieces ever written for the violin. Now I just need to find an appropriate video that uses it and I'm done here.